Our manual actuators can be equipped with accessories to achieve certain functions. Below you will find some examples of what we can offer. Our HSR hand lever in its standard configuration can be locked in either the “open” or “closed” position using a padlock. Our other hand levers can be equipped with locking device. Limit switchers: Our hand levers can also be fitted with limit switchers and sensors for electronic indication. Contact SOMAS for further information on which switches to choose. 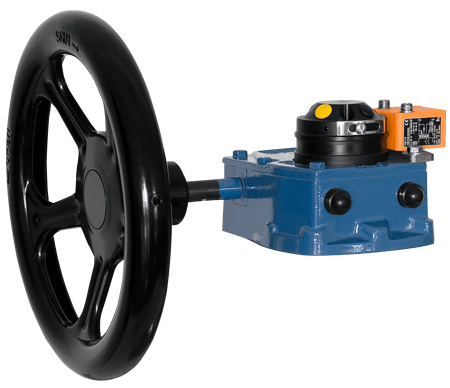 “On deck”-applications: Gear units designed for “On deck-”applications are painted in accordance with Jotun specification: BSK-99. Corrosion Class C5 M, type code: S7.09. Gear units can be equipped with locking device so that the valve can be locked in the open or closed position. This device can be installed retroactively on older gear units as well. Gear units can also be fitted with limit switches and other sensors for electronic indication. Contact SOMAS for further information on which switches to choose. For more information about accessories for manual actuators, or any documentation related to any of our other products or services please click below.